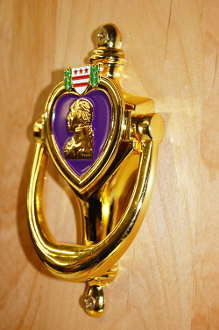 Our New EXCLUSIVE Custom Made Purple Heart Door Knocker. These are 5" Tall 2.5" wide and the Heart measures 2" x 1.75" . We created, designed and had these custom made to Honor Our Recipients. Great for the Front Door, Back Door or Office Door.